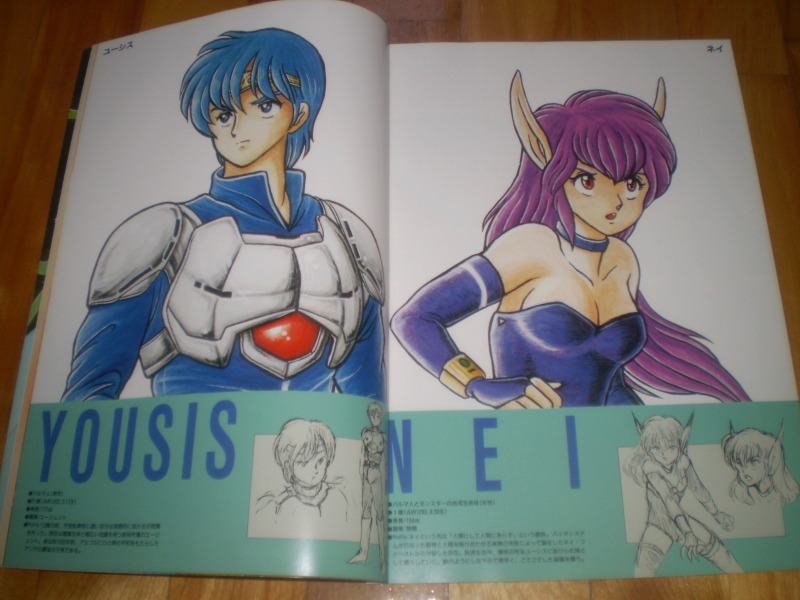 A pair of short biographies from the Phantasy Star II section of Phantasy Star Collection feature Rolf and Nei on pages 11 and 12. Rolf's original Japanese name is translated as Yousis here, but this is an atypical translation not used in other published materials. The name is usually presented as Eusis instead. Next to the sketches at the bottom of each page, some profile information like height and birth date is provided. Cool pics, and interesting info about the names. I think I like Rolf better than "Yousis", although, "Eusis", isn't too bad. "Yousis" may be atypical in most of western web-pages, but in terms of official Japanese sources and material, I think it is the most used, because not only it appears in this art-book (Phantasy Star Collection) and latter republish in Saturn, but also in the original PS Text Adventure and latter ports like SegaAges for PS2. ...and since that Compendium translation was the best and only source we had/have, everyone started to use those. Latter some roms from the original Sega Telnet and every other port (like SegaAges) surfaced and confirmed the romanization given by this official Japanese book. This is also applies for "Kainz" (PS team romanization) vs "Kinds" (Kanzume's team romanization). I may like the spell and sound of "Eusis" better, but the truth is "Yousis" is more near to ユーシス (yuushisu/Youshis) than Eusis... and more legitimate too. Last edited by newsblade on Sat Jun 23, '12, 4:45 pm, edited 6 times in total. I'm not sure if I was aware of the two different text adventure versions at the time I originally wrote the first post here. Looking over the materials available to me now, I have to agree with what you've said. Eusis is much less common than I originally thought. It was just the first to become known in the west, thanks to Naflign getting the Game no Kanzume discs, and popularized by the Compendium translation. Everything else uses ユーシス. One book actually lists "Rolf" alongside that. The game manual seems to use 主人公, if I read it correctly. Google translates that as "the hero." Now, I'm inclined to consider Yusis, from the Complete Collection image filenames, to possibly be less valid. It tends to use some very usual names on some characters. Examples include Ludy for Chaz, Slay for Rune, and Hyui for Hugh. The less said about it using Kain for Rhys' name, the better. Last edited by Thoul on Sat Jun 23, '12, 8:35 pm, edited 2 times in total. I didn't knew all those romanization existed! Last edited by newsblade on Sat Jun 23, '12, 9:08 pm, edited 1 time in total. The possibility of the filenames being shortened occurred to me as well, but I don't think it's the case here. Some of the file names are really long. The art of Amy healing Rolf's arm actually has one of the longest names, 15_ps2_anneandyusishealp19.bmp. Some other examples of filenames are 04_ps2_yusis.bmp and 14_ps2_anneandyusisp40.bmp. The files that are the Text Adventure game ROMs do have shortened filenames, though. Rolf's is ps2tyush.sgd, for example. There are actually two versions of Nei's game on the disc. I think one is the original and the other is the Kanzume version, but I'm not sure. If I'm right about that, the playable one is the Kanzume version, which is a file named ps2tnei_fixed.bin. That makes me wonder what was fixed from the other file, ps2tnei.bin. Great picture and very interesting explanations about the different names ! The names are great indeed and the japanese writings are very interesting : I would like to have been able to decipher them more easily !